Celebrate the birth of the Island City of Alameda, California, with a free public art event open to all ages. 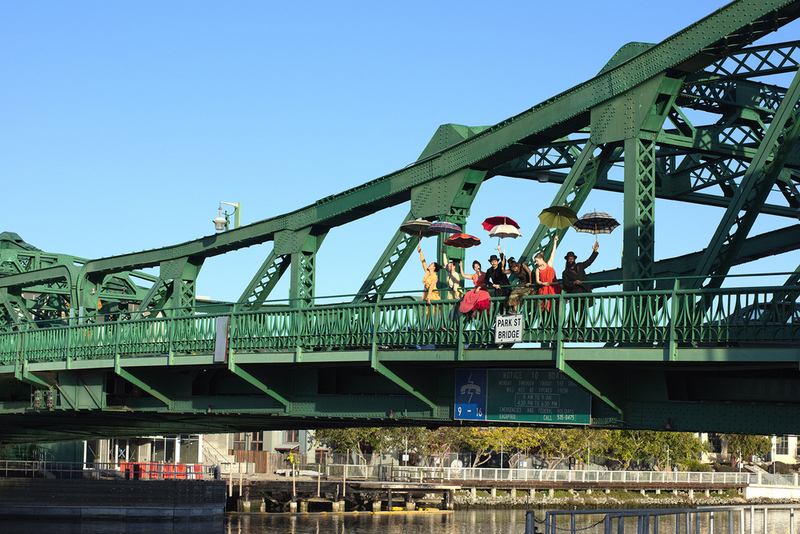 Audiences will be taken on a guided journey to four sites along the water’s edge — between the Fruitvale and the Park Street bridges — to experience art, dance, music and tales connecting them to Alameda’s rich maritime past. Tours reserved for Alameda Unified middle school students. This event is free and open to the public. Advance reservations are now full. Remaining slots will be held for walk-ups on the day of the events. Tours will be filled on a first-come, first-served basis. Please arrive at least 30 minutes early to park and check in. Walking, biking and public transportation are strongly encouraged. Bicycle valets will be available, and volunteers will be on site to guide visitors to parking and registration. Each tour covers a half-mile walking route. All outdoor pathways and indoor sites are ADA-compliant. Public restrooms and a water station will be available. Please, no pets (registered service animals only). A free event featuring video selection of stories with a live musical performance by Maze Daiko. As part of Island City Waterways, we invite you to record a short video answering the question, “How did you get here?” Everyone comes from somewhere. Please tell us your story or your family’s story. Record your video and upload it to YouTube with the title “Your First Name - Island City Waterways” and this brief description: How did you get here? As part of Island City Waterways, Rhythmix Cultural Works asks Bay Area residents to share stories about how their families came to live in the region. We’ll add it to our playlist so others can be inspired by your family’s history. How did you and/or your relatives get here? Try to keep your video to two minutes or less. We recommend shooting it against a plain wall or background with your camera far enough away to include at least your head and shoulders in the frame. By uploading your video with the words “Island City Waterways” in the title, you agree to allow Rhythmix Cultural Works, a nonprofit community arts center, to add your video to its YouTube playlist and include portions of it in programs and promotional materials related to Island City Waterways. Use the arts to celebrate and share Alameda’s unique cultural heritage with diverse audiences from around the Bay Area. Foster community by connecting audiences, local organizations and artists to one another, to history, and to the place they live. Expand access to the arts by producing a free public art event that invites audience involvement and participation. Create opportunities for families to share their personal cultural histories. Throughout history, specific events have caused waves of population to crash onto Alameda’s shores. Whether Gold Rush settlers, World War veterans or recent tech transplants, certain groups have arrived at various times to change Alameda’s population significantly. Through the discussion of 12 historic waves of immigration, local historians Dennis Evanosky and Eric J. Kos will highlight events that transpired around the world to move people to Alameda. As part of the event, participants are invited to record a short video response to the question, “How did you get here?” in a kiosk dedicated to collecting stories about the circumstances that led people’s families to come to the Bay Area. Ginny Parsons, Industry at Alameda Point, 2016. Courtesy the artist. In conjunction with Island City Waterways, the K Gallery at Rhythmix Cultural Works presents a three-person exhibition featuring new works by environmental painter Ginny Parsons, photographer Pons Maar, and industrial designer and artist Marc Ribaud. All three artists reside in Alameda, and each investigates the industrial landscape along the water’s edge. Parsons draws inspiration from the natural environment to create abstracted landscapes that incorporate household materials such as Borax and house paint. Maar photographs the shoreline, deserted warehouses, and the natural beauty of Alameda Point as a way to capture what is disappearing to make way for a new planned community. For this exhibition, Ribaud will render a large-scale map of parts of the shoreline in a site-specific graphite wall drawing, as well as construct a video kiosk resembling a boat’s hull where audiences can record stories about how their families came to the Bay Area. Gallery hours are Wednesdays 6 pm to 9 pm, for events, and by appointment. Meet award-winning choreographer Kim Epifano, along with professional dancers Antoine Hunter and Zahn Simon, who are deaf, as they share how they communicate through movement and serve as role models for success in the arts. This lecture and demonstration features dance that integrates sign language as a source of choreography, text and audience echoing. Presented in partnership with the Asian Pacific Islander Disability Awareness Project of Buena Vista United Methodist Church and supported in part through a generous grant from the James Irvine Foundation. Join Rhythmix Cultural Works founder and artistic director Janet Koike for a presentation about Island City Waterways, the organization’s recent free public art event that took audiences on a guided art tour exploring how the waterways have shaped Alameda’s past and present. 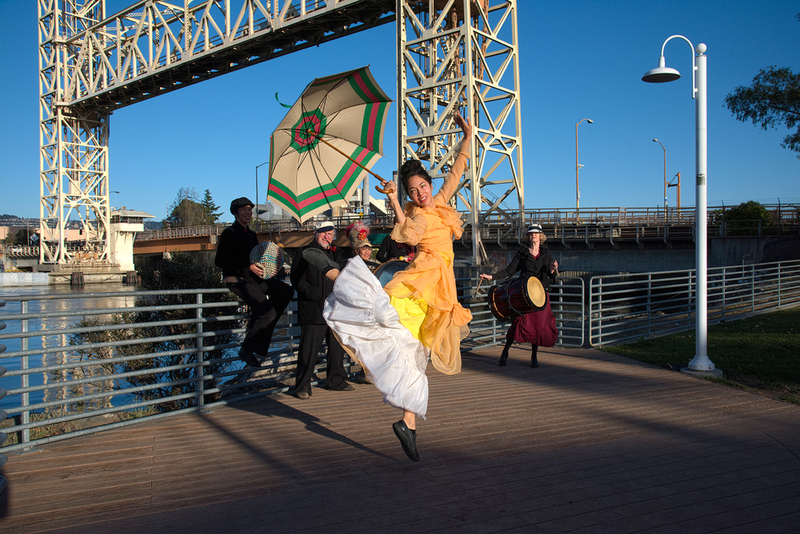 Featuring nearly three dozen dancers, musicians, storytellers and visual artists, the event took place from May 20–22, with a total of eight 90-minute tours leading more than 1,000 participants to public performances along the Waterfront Trail between the Fruitvale and the Park Street bridges. Island City Waterways celebrated the waves of immigrants who came from many parts of the world to settle in Alameda, and asked the audience, “how did you get here?” Audiences were invited to record stories of how their own families came to be in Alameda and the Bay Area. Waves of Origin will feature a video selection of the stories, as well as a live musical performance by taiko fusion ensemble Maze Daiko and actor Ed Holmes in character as the Old Mariner. Original sketch for mural on sail cloth by Mark Lewis Wagner, 2016. Courtesy the artist.